The Environmental Satellite (Envisat)-1 is the successor to the European Space Agency (ESA) Remote Sensing Satellites ERS-1 and ERS-2. Designed and built for ESA by EADS Astrium, Envisat was launched in 2002 and provides environmental monitoring data. Europe's largest ever Earth observation satellite, the 8.2 tonnes-spacecraft Envisat was developed with EADS Astrium as a prime contractor. 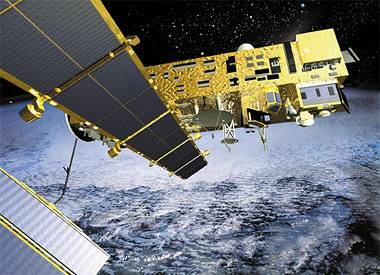 The Advanced Synthetic Aperture Radar (ASAR) instrument on board the ENVISAT satellite extends the mission of the Active Microwave Instrument (AMI) Synthetic Aperture Radar (SAR) instruments flown on the European Remote Sensing (ERS) Satellites ERS-1 and ERS-2. ASAR uses an active phased-array antenna, with incidence angles between 15 and 45 degrees. Envisat was a dual polarisation radar and transmitted alternatingly vertically- and horizontally-polarized electro-magnetic waves. The backscatter from these transmitted waves were received on two separate channels simultaneously, so that ASAR could provide derivation of the complete scattering matrix of a scene on a pixel by pixel basis.